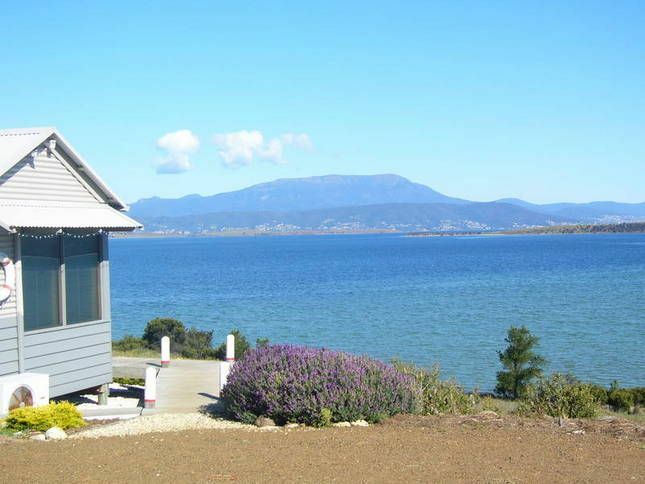 The Boat Shed is a modern waterfront holiday cottage on a secluded 5 acres, with views across Ralphs Bay to Mt Wellington and Hobart. Situated in an outer suburb of Hobart, The Boat Shed offers cosy self contained accommodation with all facilities. It's like a home away from home! It's far enough from town to provide solitude, but close enough to enjoy the many attractions of Hobart and Tasmania's South. With views from every window, even the bathroom, the outlook will captivate you. Not a noise to be heard except the birds and not a person to be seen - except for an occasional wind surfer or walker passing by. Walking tracks are at your front door. The Tangara Trail starts at South Arm, passes by the Boat Shed, and ends at Seven Mile beach, a distance of 15 kilometers. The Boat Shed overlooks Gorringes Beach on Mortimer Bay with 3 kilometers of white sandy beach to stroll along, and hardly a soul to be seen. From the Boat Shed, it is an easy drive to all places on the Tasman Peninsula, 20 minutes to the airport, 25 minutes to historic Richmond and a leisurely drive into Hobart. Close to golf courses, wineries, restaurants, horse riding and the beautiful beaches of the South Arm and Tasman Peninsulas. Included in The Boat Shed is heating and air-conditioning, queen sized bed, television, DVD/CD player, gas cook-top, microwave/convection oven, dishwasher, toaster, full sized refrigerator/freezer, hair dryer, iron and ironing board and washing machine. All linen, crockery and cutlery is also provided. The views were stunning and everything about the cottage was way above first class. A little gem. We'll be back soon. Everything you need for a perfect break. Close to the city yet a world away. We had a wonderful time the boat shed is great it has everything you need it is extremely comfortable. The little extra touches the starter breakfast, home made cake make you feel very welcome. The Boat shed is a great place to base yourself to do day trips to Hobart and beyond and there are just no words to describe the amazing panoramic view. We had such a relaxing stay. The property is private and views amazing. So much attention to detail and it was all perfect. Wonderful provisions left for us. Loved shopping at the Hill street food store.